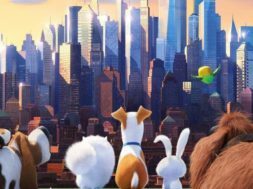 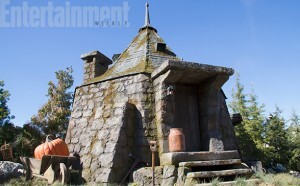 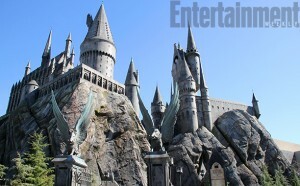 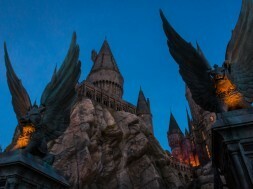 Earlier today, Entertainment Weekly released the first in a series of sneak peeks at Universal Hollywood’s Wizarding World of Harry Potter, affectionately nicknamed “Wizarding World West” by many fans. 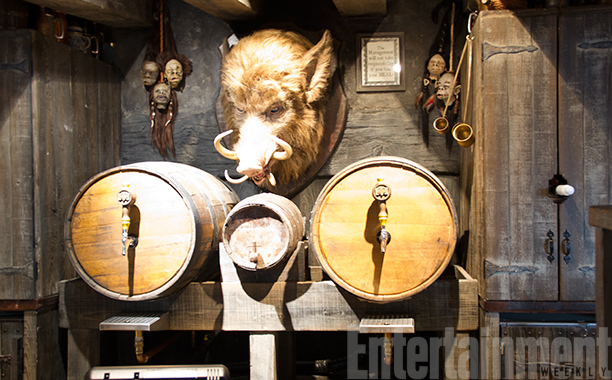 The first look includes thirty exclusive photos from beyond the construction walls, including close looks at the area’s various stores and details. 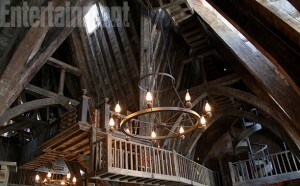 The area’s interiors and exteriors look extremely close to completion. 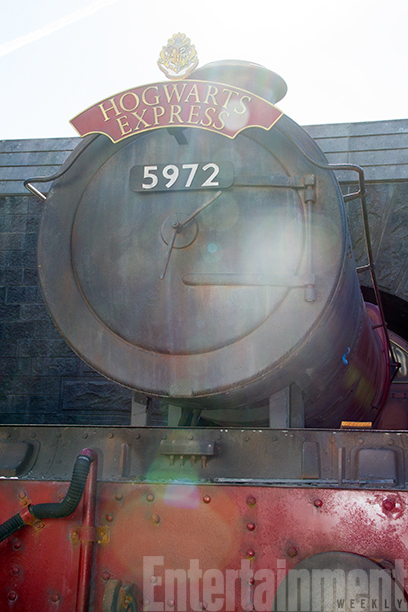 Expect unannounced previews in the coming weeks after finishing touches are made and team members complete training. 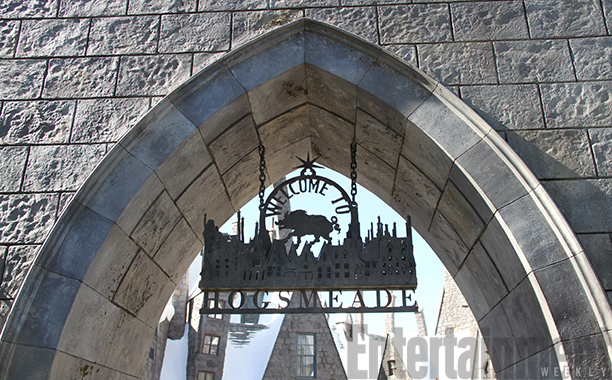 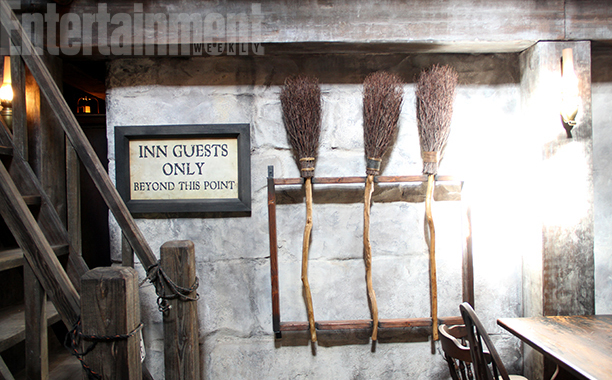 One photo, seen below, reveals a side entry sign new to Universal Hollywood. 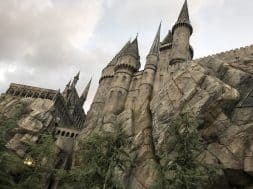 The article confirms several new details, including the reappearance of the Gringotts-themed ATM (first seen at Universal Orlando near the Three Broomsticks). 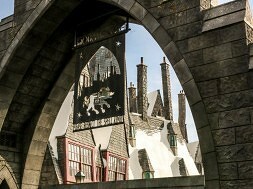 Confirmed products include warm butterbeer, Firewhiskey, and the three exclusive Wizarding World beers featured in Orlando. 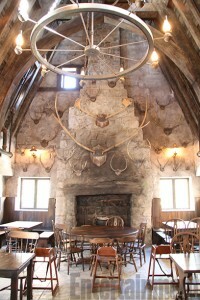 Guests will find the Weasely Ford Angela crashed at the foot of the mountain near the entrance to the Forbidden Journey attraction. 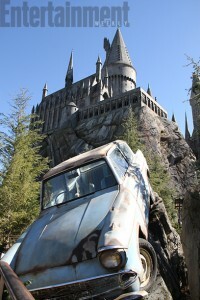 An intact model of the car can currently be spotted on the Lower Lot. 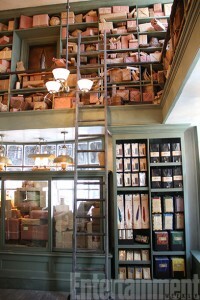 The most significant addition is a Hogwarts Express photo op in the space occupied by Dragon Challenge lockers in Orlando’s Hogsmeade. 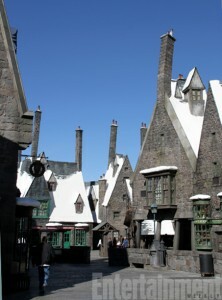 (The enormous outdoor Dragon Challenge coasters are the only rides that didn’t make the jump to Hollywood.) 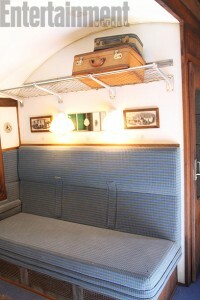 Guests will have a chance to pose in their own cabin on the famous train. 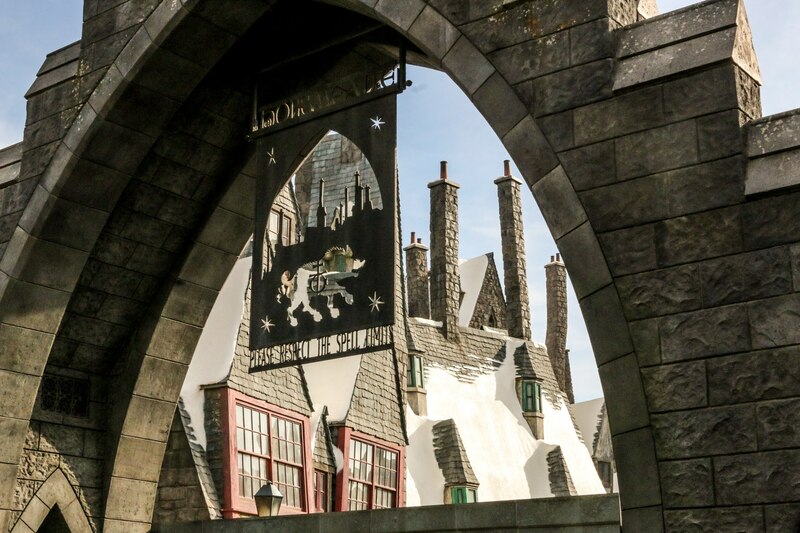 A green screen window will augment the sure-to-be-popular photo spot. 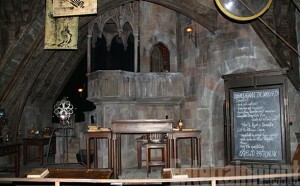 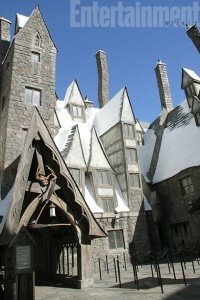 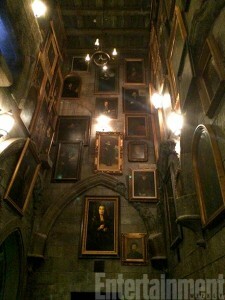 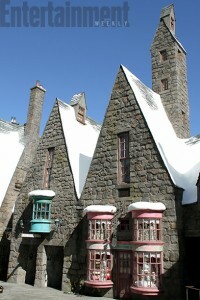 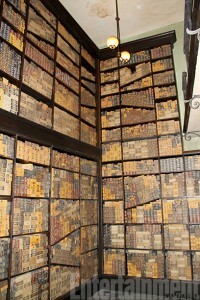 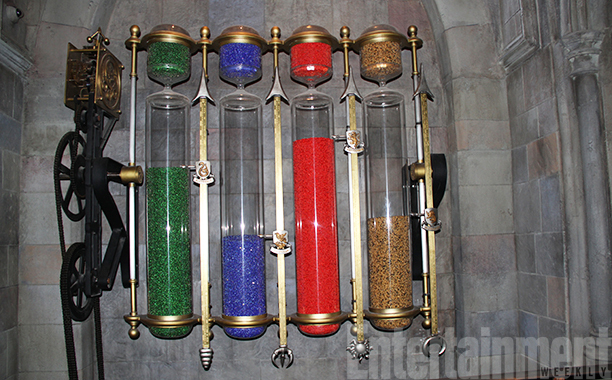 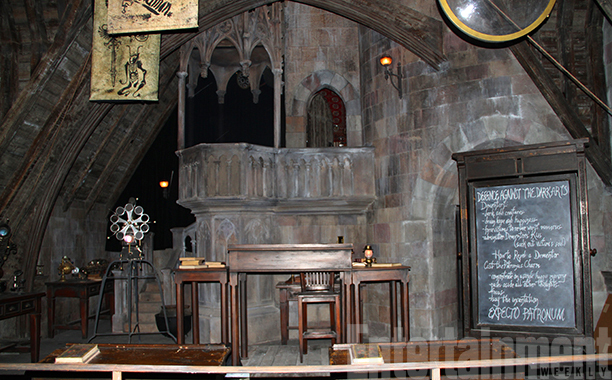 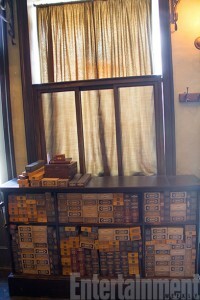 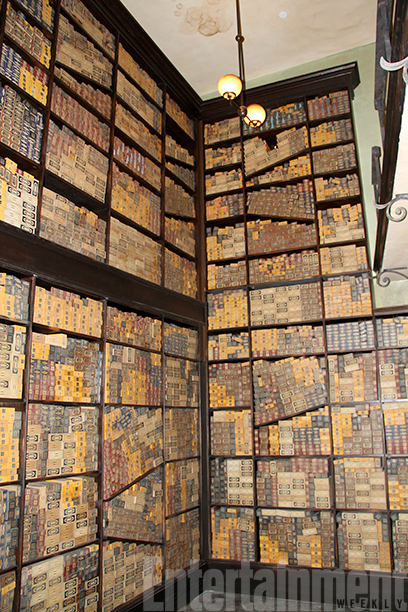 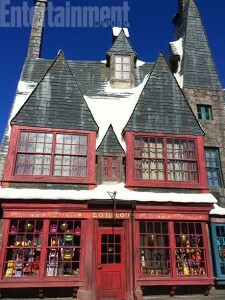 The write-up trumpets the Wizarding World’s film accuracy and promises designers sprinkled screen-used props amongst the replicas that decorate the land’s shops and attractions. 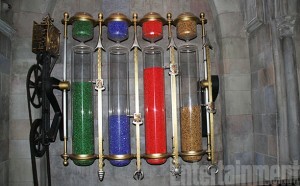 We also now know there will be eleven interactive wand locations throughout the land, two more than Hogsmeade in Orlando. Zonkos, a joke & gag shop, closed in Orlando in the wake of Diagon Alley’s Weasely Wizard Wheezes. 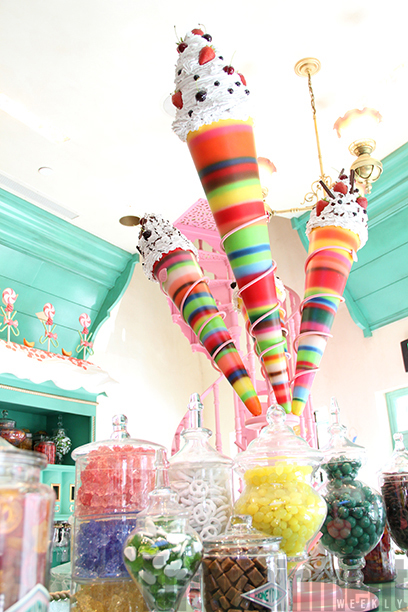 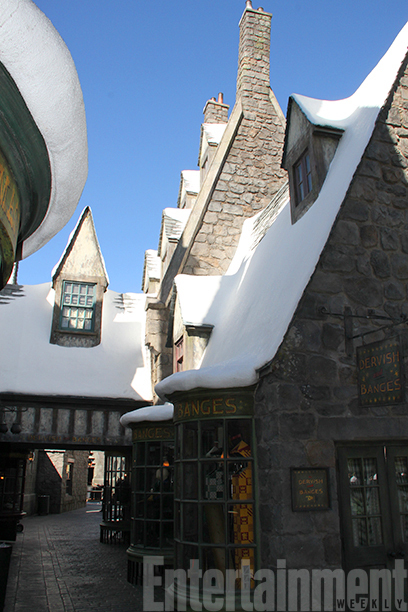 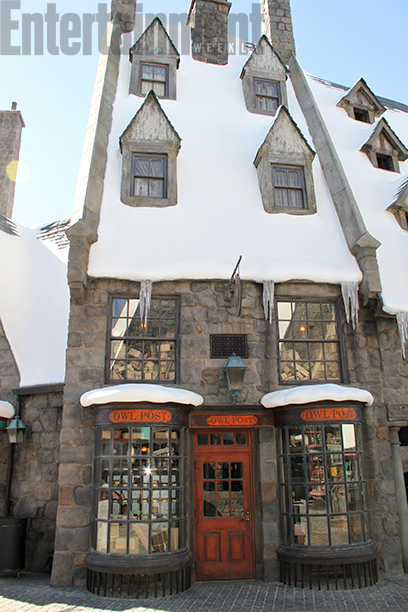 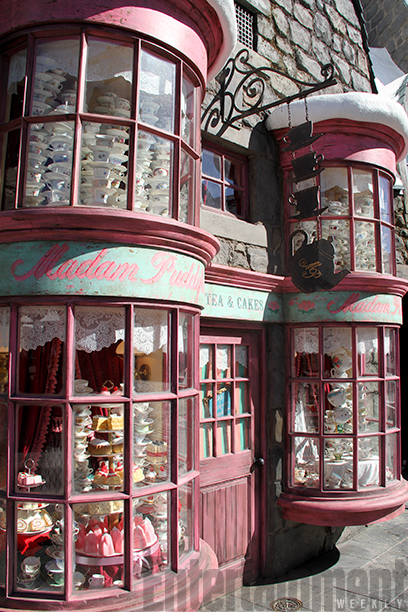 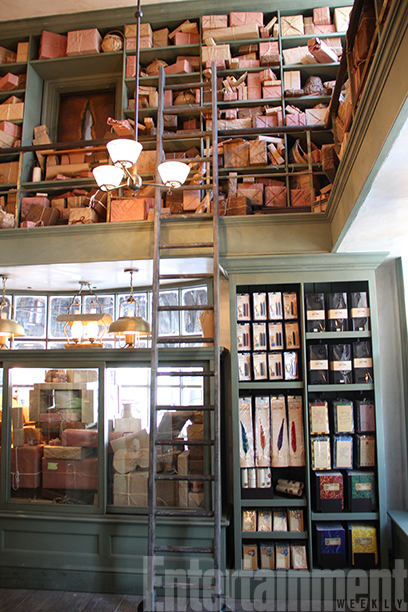 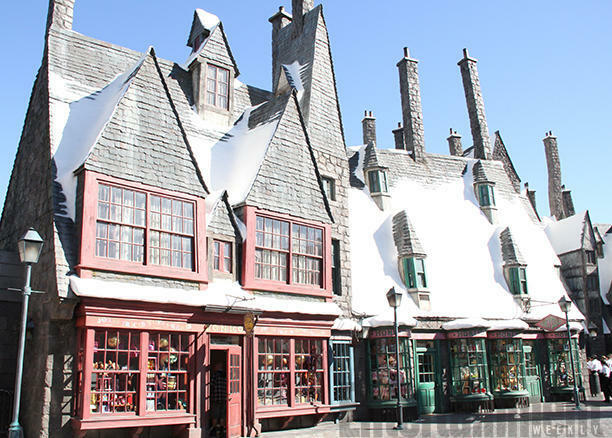 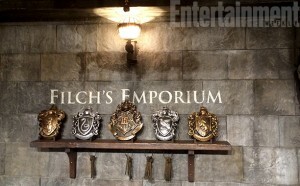 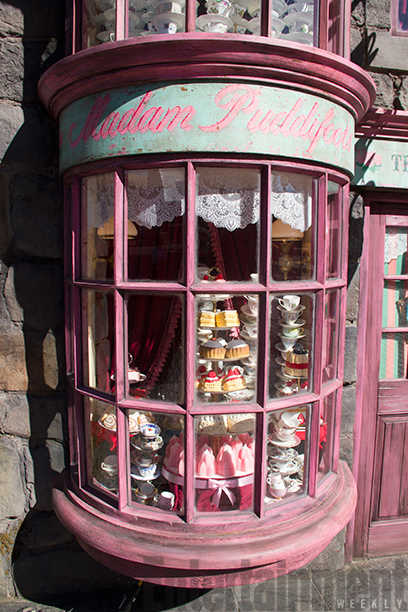 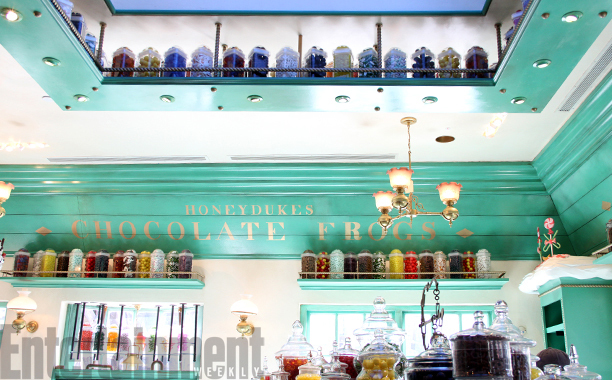 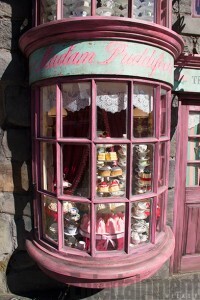 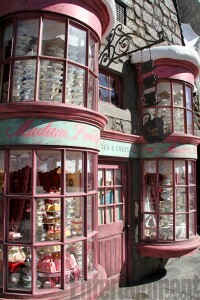 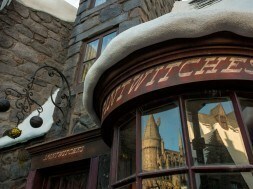 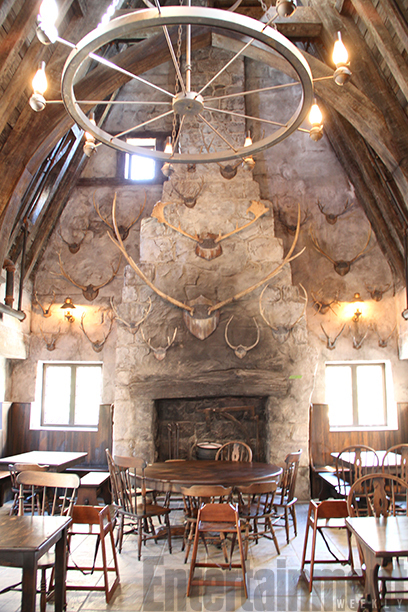 It returns in Hollywood’s Hogsmeade and functions as the park’s only joke shop. 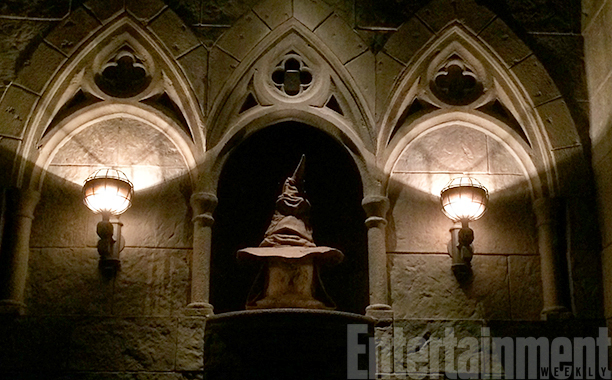 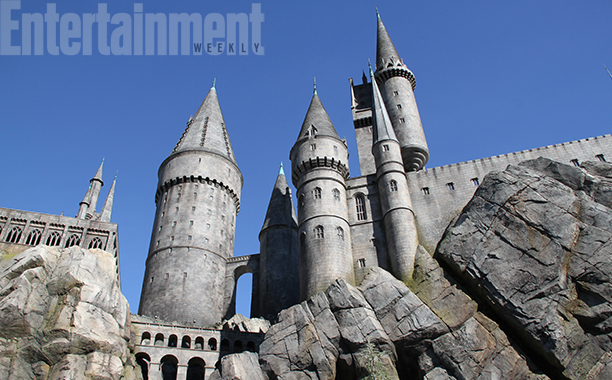 The Wizarding World of Harry Potter opens on April 7th, 2016. 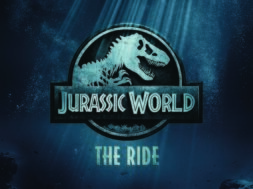 We anticipate technical rehearsals (soft openings) in the weeks ahead of the official grand opening and will keep you informed. Check back for additional Wizarding World of Harry Potter coverage in the weeks leading up to the grand opening. In the meantime, enjoy the full photo set from the sneak peek, courtesy of Entertainment Weekly.